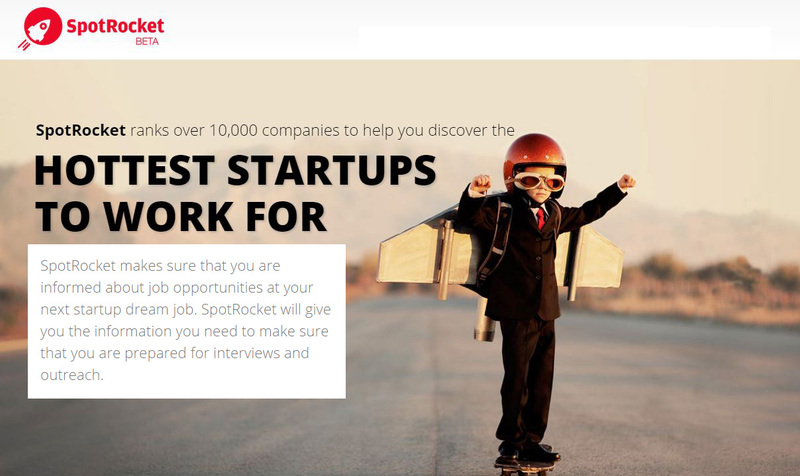 SpotRocket Can Find the Next Big Startup for You to Work At! Working at a startup is simultaneously fun and intensely challenging. Wearing many hats is the norm not an exception and you’ll never hear “I didn’t sign up for this” being uttered in the unconventional workplace (think bean bags, indoor hammocks and Xbox) of a startup! You learn so much and your work is more like your baby than an excel sheet entry. Don’t get me wrong, there are joys of being employed at a big firm as well…just kidding! Corporate job is for zombies! We at Startup Dope promote the entrepreneurial spirit by documenting the trials and tribulations of new startups but we can’t predict whether they will go on to become the next WhatsApp or Xiaomi or Instagram. In that way, SpotRocket is the perfect sister site to Startup Dope. We promote and they rank startups using a slick algorithm that takes into account qualitative and quantitative metrics – basically calculating the Hotness Quotient of startups! The company originally had six co-founders, of which three – Payal Agrawal Divakaran, Cherian Kurien and Tim Chaves – decided to keep working on the idea which started out of a classroom. They are all second year students at Harvard Business School and started SpotRocket during a first year class. They noticed that everyone on the campus was interested in startups and many wanted to work at one but no one knew how to find the really good ones. The usual process involved a lot of online research or using personal networks, both of which were time-consuming and tedious. So, they decided to build a website that would solve this startup discovery problem and also provide a user-friendly solution. The team created an algorithm to rank startups based on metrics like funding, investor pedigree, social media metrics, and website traffic momentum. And they had the right skills for the task. Payal was previously in technology investing firm, so had experience with many of the hottest tech companies in the space. That experience was invaluable in creating the algorithm. Tim had been a developer, so was crucial in creating the beautiful website and its functionality. Cherian came from an accounting background with an international perspective. SpotRocket is a website that ranks global startups as well as allows them to post jobs to tap into a highly interested and skilled group of 4,500+ registered users from 300+ colleges/universities. Several startups, including well-known ones such as Eventbrite and Bounce Exchange, have posted jobs on SpotRocket. SpotRocket is poised to take-off and it wants to have you on board! Head over to their base station by clicking the link below! Use ClipDis To Create Your Own Movie Mash-ups! Previous articleAugur Lets You Identify Anonymous Traffic Hitting Your Website! Next articleGet User Feedbacks With The Help Of UsersThink!